Early on Saturday morning, I was rushing to pick up coffee for an event. Rain lightly drizzled, and I ran across the parking lot. A friend was with me, and I called him to stop. “Look at that puddle,” I said. 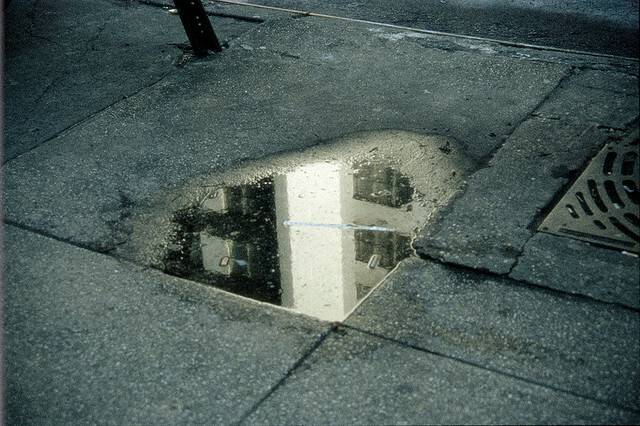 That puddle, like almost every puddle except on the cloudiest of days, reflected the trees and the shops around us. As we walked around it, we could see the reflections change. Nature. Buildings. Penny, candy wrapper, and dead leaves at the bottom of the puddle. The magic of reflection amazes me every time and noticing puddles has become a spiritual practice of mine. How often do we stop and notice water? The puddles, the rivers, the ocean? The showers, the washing machines, the toilets, the sprinklers? In industrialized nations, we have largely forgotten just how dependent we are on water. In most places in the US, we can turn on a tap, at any time of any day, and have clean, potable water flow until we turn it off. That is amazing! These past few years, with hurricanes like Katrina, natural disasters like the tsunamis in Asia, and anthropogenic disasters like the BP oil disaster, I have been reminded of waters abilities to both give life and to take life. I am reminded that we cannot survive without water, as I hear about the deaths of immigrants crossing the deserts in the Southwest. And I am astounded when I hear statistics about how in Boston, people of color are four times more likely to have their water shut off. I once lost water for a day, and I became quickly aware of what it meant to not be able to flush my toilet, to not be able to turn on the sink. I can’t even imagine what this must be like to be struggling AND to have my water turned off. Unitarian Universalists (UUs) all over are thinking about water justice, from the UU Legislative Ministry of California’s campaign to pass legislation on the Human Right to Water to congregations in New York examining the impacts of natural gas hydraulic fracturing on watersheds. As UUs, we are called to respect the interdependent web of all existence and water is a common thread. For Earth Day 2011, UU Ministry for Earth (UUMFE) is asking congregations to celebrate the sacred waters that sustain us all and to commit to 40 days of actions that will make our world more just. I am making a commitment to water for 40 days, to take some time to deepen my reflections on water. To see the holy in the every day. And to move my actions a little more closely in line with my values of justice for all. This past year, I have held the BP oil disaster heavy in my heart. I understand that the three main industries along the Gulf Coast are oil drilling, seafood, and tourism–and all three were devastated by this disaster. People live off that water, more closely than I ever have, and likely ever will. And yet my own demands for oil, for transportation, for heating, for my plastic watch, my plastic pens, my plastic lunch container, my plastic toothbrush…produced in oil-using factories and transported by oil-using vehicles. How am I complicit in this disaster? How much oil do we really need? For the 40/40 Earth Day Challenge, I am trying to avoid plastic as much as possible for 40 days. It’s certainly impossible in my life right now for me to avoid it all together, but I am starting with awakening to the pervasive presence of plastics in my life and am going to see what I can do to reduce my dependence on oil. I made it! I learned a lot about how I use sugar to overcome exhaustion–ironic because of course it wears me out! Now the trick is to keep myself from reverting to old, bad habits. Interesting that I don’t crave sugar now –I hope I can keep it that way! This weekend, even though the experiment was almost over, I was camping and succumbed to my meat cravings a couple of times. I was pretty sure that this meat was not locally or sustainably raised. I wasn’t wracked with guilt, but I was a little disappointed at my own lack of resolve and how easy it was for to justify the slip ups to myself. I think there’s a lesson here about falling off the proverbial wagon. I heard this lesson again in a yoga class I took while camping. The teacher kept repeating, “It’s not how many times you stop, but how many times you start again.” So at the moment, I’m just working on observing myself and my inclinations and desires, including my wish to live a life that is authentic and sustainable and satisfying. I’m grateful for the start that 40/40/40 has given me, and I am looking forward to continually starting again. What stands out as I reflect on my 40/40/40 commitment is the “pregnant pause” that came after I asked a business or friend if their coffee was fair trade. In that brief moment, it felt like everyone (including me) was evaluating the extent to which my request was legitimate and the extent to which it was annoying. I will continue to reflect on this dynamic, and especially how asking for justice can often seem “impolite”. There’s a place for decorum, of course, but perhaps I need to be more comfortable with creating tension for the right reasons. It was fascinating to see how this played out for me–the messaging I told myself, the time it takes, and the effects of eating with others, and the impact it had on my buying habits. When I focused on gratitude for everything that brought me the food, taking the time was much more enjoyable. It was hard to enjoy my food when I was outraged about everything that I don’t know about the growing methods and how the workers were treated, or the fact that my banana coming from South America cost less than my apple from New England. I found myself paying more close attention in the supermarket about my food choices and growing methods. Sometimes, in a rush, I would think a grace to myself while preparing my food or running around, and I sometimes found it more challenging than I would have expected. Saying grace was a practice I most appreciated when sharing food with friends–good food and good company. I’ve learned that it’s only as powerful as the mindfulness I bring to it. My family gave up red meat for the 40-40-40 campaign. To tell you the truth I felt a bit guilty as I thought we were picking something very easy since we rarely eat it and even more rarely cook it at home. We were surprised to learn that the occasional times we have bacon with our eggs or decide to grab a steak sub rather than cook at all some nights were more frequent than we realized. The capper came when we were attending the local annual May Fair and decided not to get the Indian food we often get that contains red meat. Instead we went to the organic green food both and got falafel salads where we saw among posted factoids the statement that a vegetarian driving a hummer has a smaller carbon foot print than the meat-eating Prius driver. Well I went on the web to learn more about that and found out that particular fact is inaccurate but my research headed me towards a lot of other great perspectives. Here is one I’d like to share http://www.mnn.com/earth-matters/energy/blogs/the-prius-driving-vegan-vs-the-meat-eating-bicyclist-who-is-the-better. My family can’t claim to be vegan bicyclists yet but the spiritual practice and mindfulness of participating in the 40-40-40 with other members of our congregation (First Parish Cambridge) led us to start being mindful in a lot of different ways about our environmental impact. We’re all biking even more and saying no thanks to the hamburgers! As part of the 40/40/40 for the Earth campaign, I’ve resolved to drink only fairly traded coffee for 40 days. Admittedly, I knew it would not a be huge stretch since most of the places I frequently drink coffee already use or offer fair trade options: the office (we use Equal Exchange) , my school (Wesley Theological Seminary’s Dining Services Company, Meriwether-Godsey, has great fair/local/green commitments), and my home (we buy from Zeke’s, a Baltimore-based company owned by an old family friend that produces amazing coffee). 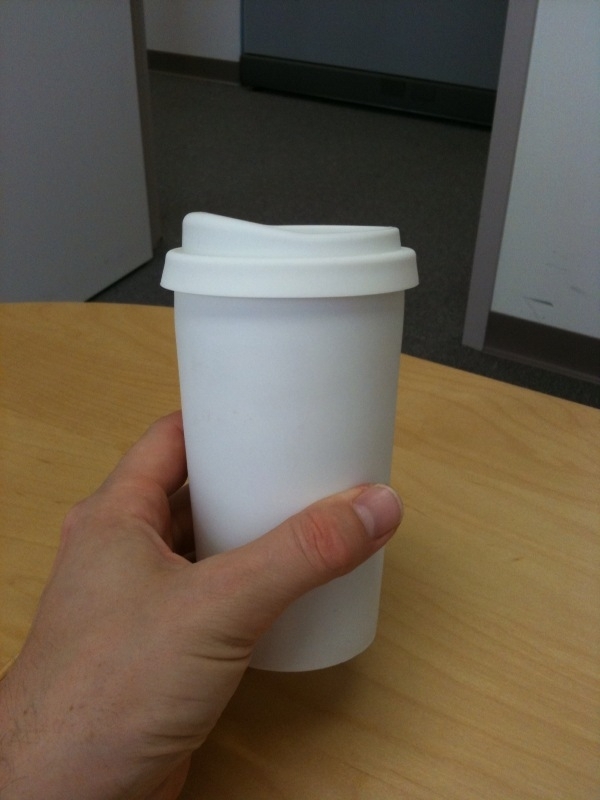 Feeling adventuresome, I took my ceramic, it’s-reusable-but-it-looks-like-a-to-go cup for a survey tour of the four coffee shops within one block of our office. None of the options (two national chains, one regional chain, and one independent shop) sold cups of fair trade coffee, although Starbucks sold bags of fairly-traded beans. Disappointing, but not surprising. I could have entered my lobbying phase, but I chose to leave it at that. My sense is that the question expressed my desire well enough, and that any additional advocacy would simply have been annoying. Maybe I’ll bring it up again in the future, after we’ve both had time to think about it. Guest post from Nicole McConvery, from the International Office. I, admittedly naively, have decided to commit myself to foraging for local food only, over the next 40 days. This was inspired by the realization that almost everything I eat comes from pretty far away; I’d never really pondered that fact until now. Much of this food has seen more of the world than I have, traversing the globe via planes, trains, and automobiles, leaving quite the carbon trail in its wake. I’m not so sure I can continue to consume blindly without committing some cognitive energy, and a little conscientious action, towards making decisions that are a little easier on the planet. On the eve of my personal challenge, I realized with comical dread that I hadn’t yet purchased anything to feed myself over the next couple of days. (The weekend is a much easier time to visit local farms/farmstands). So, I decided to hit up the local Whole Foods. As I roamed the immaculately kept aisles, my eyes darted up to the tops of every food sign, which mark the origin of each product. I kind of balked at the dearth of local produce; all I could find in the veggie area were a bunch of run-down looking fiddlehead ferns, which don’t sound particularly edible. Ever the crusader of comestibles, I grabbed a modest bunch despite my reservations. We don’t grow carrots here (in MA)? Cucumbers? Lettuce? What’s with that?! — I know that’s not true, but wow, it’s really that much cheaper to ship food from the other side of the planet than to grow some of it here? I was equally disheartened to find only locally-made apple cider available in the fruit aisle. Everything that I would normally gravitate towards seemed to come from California (note to self). That set the tone for my purposeful ambling; I didn’t come across much that would fulfill the constraints of my personal challenge and still provide for my dietary restrictions, but what I did find fit the bill for the next few days: locally made hummus, wraps, eggs, cheese, and those crazy ferns. My inner monologue was pretty amusing as I examined packaging and started to question everything when I realized food distributors are not necessarily where the food/ingredients originate. I kept arguing with myself about how I was defining “local.” Whole Foods seemed to define it as MA, NH, VT, and ME. That’s fine with me. I was astonished, though, to see that the local products often cost significantly more than their from-far-away counterparts. I decided to keep pushing the issue with myself, and widened my “local” net to include CT and NY, only if I had to. At least the pricing forced me to keep asking myself do I really need this? However, I needed to be honest about any exceptions I had to make with this challenge (so far): soy/tofu, spices (that I already have in my kitchen), and rice (though I will try to cut back). I am really reliant on soy as I don’t eat much meat; luckily local fish isn’t too hard to come by. I can’t stand milk but I am big on yogurt and cheese; thankfully Cabot and Stonyfield fall within my regional constraints. Fruit juice I can do without (I tend towards water anyways). I don’t drink coffee (don’t look at me that way! ), but sometimes tea. And spices! For me, essential. But what about all that wonderful ethnic food I love to eat? By default, most of it breaches my personal contract. How long can I go without kimchi, soba, wakame, curry, boba? Time will tell. I have to be completely forthcoming about one particular fact: I will need to break out the Asian sauces every so often. To that end, I’m grateful for the discovery of Chef Myron’s delicious, locally made ponzu and szechuan. The need for these flavors does call into question the origin of ingredients in some of these locally made products; though the sauces are assembled here in MA, I know full-well that sake and cane juice are not indigenous to this part of the country (correct me if I’m wrong?). I’ve decided to not torture myself too much about this and will evaluate items on a case-by-case basis. Next up: getting set up with a Boston Organics account. Whole Foods will work in a pinch (sort of), but if I’m really going to succeed with this challenge, I’ll need to dig deeper.